Tim gave a keynote at this new conference, co-organized by Mercedes and SXSW, in Frankfurt. In his keynote, titled “Advantage Human: Live, Lead, and Work Beautifully,” Tim argued only humans can do things beautifully, and he made the case for combining AI and dataism with a new, radical humanism. 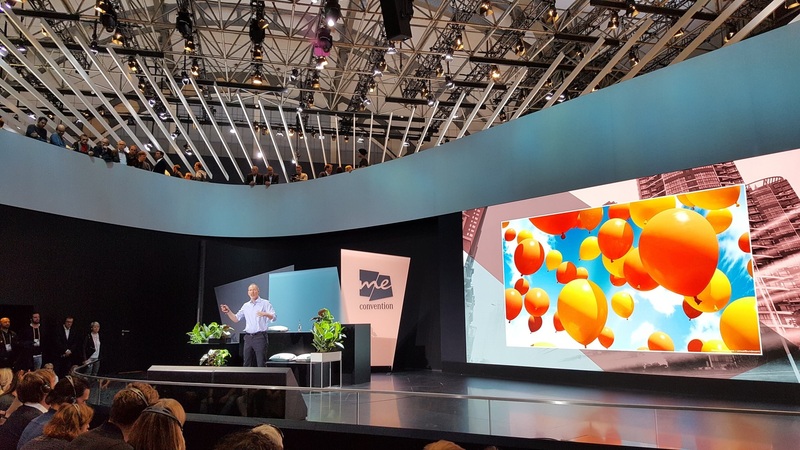 The inaugural me Convention took place in Frankfurt, Germany during the IAA (International Motor Show) September 15-17, 2017. Tim was among a speaker line-up including astronaut and rocket scientist Buzz Aldrin; Head of Industrial Design at X – The Moonshot Factory, Nick Foster; avant-garde artist and cyborg Neil Harbisson; Project Director at Snøhetta Jette Hopp; Author and travel entrepreneur Colin Wright; media artist and choreographer Christian “Mio” Loclair; journalist Amber Mac; Director of Wikimedia Foundation Katherine Maher; Editor of business magazine WirtschaftsWoche Miriam Meckel; NASA Jet Propulsion Lab multimedia specialist Sasha Samochina; workplace pioneer and Second Home co-founder Rohan Silva; professional explorer and adventurer Mike Horn; Tibetan Buddhist Monk and mindfulness specialist Gelong Thubten; and more.